My third graders begin taking their standardized state-tests this week. Since third grade is the first year for these tests in Indiana, my kids are understandably a bit nervous. No matter how much I try to reassure them that they are going to kick that test's booty prepared, who can blame them for having some anxiety? It usually comes with the 'things-we've-never-done-before' territory. So here's a little idea I'm going to try this year to hopefully give my students a little extra boost of confidence. It's our jar of "best thinking." I took a glass jar with an air tight lid, similar to a mason jar, and wrapped it with a strip of scrapbook paper. Then I attached a label to show the jar's significance. 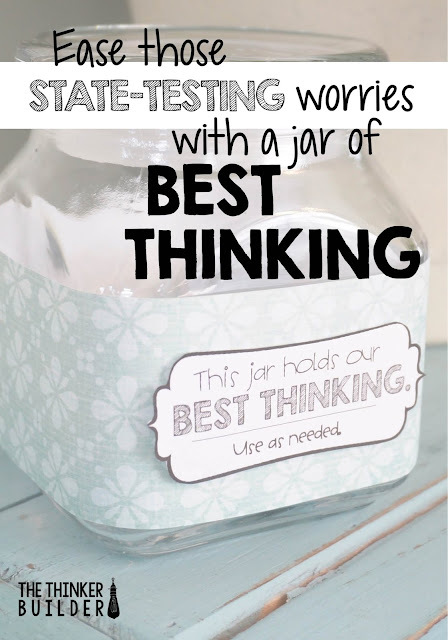 In the morning, before we begin our testing, I'll pull out this jar and tell the class, "Over the year, I've been secretly collecting your best thinking. This jar may look like just an empty, ordinary jar, but that would be a mistake. I've captured some of your most brilliant ideas in this jar. Each time our class has had a deep discussion, or solved a doozy of a problem, or written an excellent story, I've saved just a little bit of the air that surrounded it. And now, I'm going to release some of it into this room; this classroom is going to be filled with our best thinking. Just in case you need any of it during the test today, it will be floating around, waiting to help you out." You can pick up a copy of the "Jar of Best Thinking" label by clicking HERE or on the image below. "Class, as you can see, our jar is full of pencils this morning. 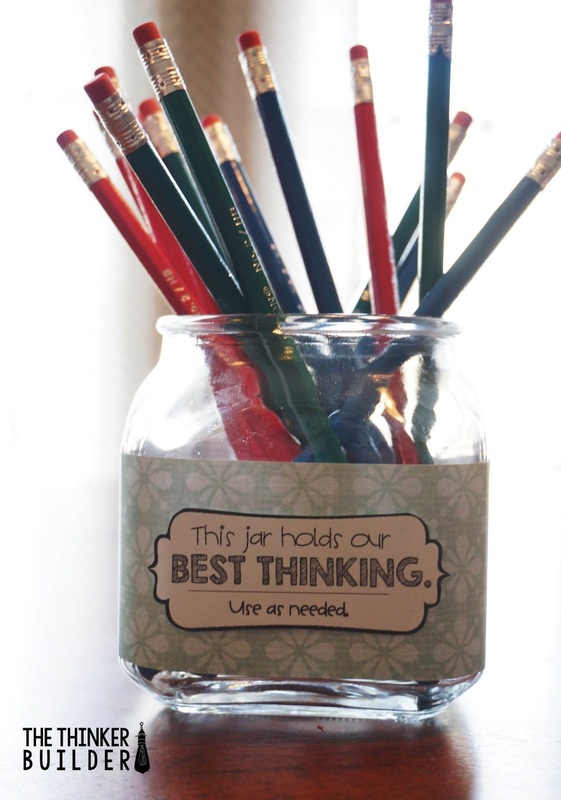 I thought it might be a good idea to 'soak' our testing-pencils in our jar of best thinking. So they've been soaking all night long for you. And I think they are now ready to go. Go ahead, take one." Okay, so a bit silly? Probably. But I think I'll at least get some smiles. Some sighs of relief. Maybe a couple of, "Oh, Mr. F., that's crazy!" And maybe, just maybe, all of our very best thinking from the whole year will be there in our room, available for all. You never know.